Have you ever wondered how the organized people of the world manage to do the tasks that they plan to do each day? Do you wish that you could be like that, knowing that you have set tasks to do each day and they get completed? Do you plan to do a task each day and you find that after the first couple of days nothing is happening and the plan that you had gets thrown in the trash? You need to start habit building. 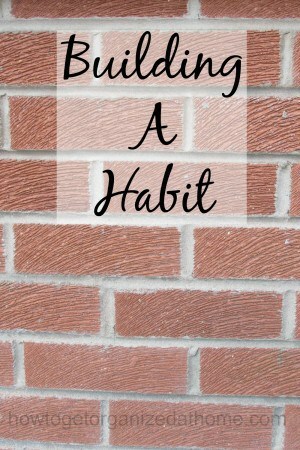 It is as simple as building habits; you need to build a habit into your daily life. It is not about coming up with a massive list of habits that you want to establish into your life, it is more about putting one habit at a time into your routine. You need to think about a habit that is easy to build into your current life style; you are not going to make drastic changes because this won’t help your habit-forming and you will quickly be defeated. Your first habit is something simple. If you are looking to eat healthier, your habit could be to eat a piece of fruit with breakfast each morning. For this habit to succeed you need to make sure that you have the fruit ready in your home. Thinking about the fruit that you are going to eat, plan what your options are and make sure that when you are shopping that you have an adequate supply of fruit. You will also need to plan your time so that you have time to prepare and eat the fruit. So, this example shows that the idea of including a simple habit of eating a piece of fruit each morning for breakfast gets derailed by a number of different factors. It is these factors that you need to tackle as well as the habit, so even though you are only trying to build one habit at a time into your routine there might be other parts to the habit that you will need to take into consideration. If you plan these other factors when you are planning a habit, you will see if the habit you are considering trying to build into your everyday life is sustainable. You need to think about the habit that you want to accommodate into your day. Write this habit at the top of a sheet of paper, then under the habit think of different ways that the habit brakes. Once you have thought about the ways that you can self-destroy a habit, you are one step closer to succeeding. You need to go through each of the negative points and work out ways in which to tackle them. Another example could be you want to go out for a walk each day. A negative point could be what if the family are home and they don’t want to go? The answer to this will depend on their age, if they are young children maybe you could find a friend who will look after them for an hour whilst you go out. Or take the children with you on your walk, suggest that you could stop at the local park; this is a great way for all the family to get the exercise that they need. Until your habit is firmly implanted into your routine it is a great idea to write it down each day and tick it off when you have completed it. This will motivate you to continue habit building. When you have conquered this habit, you will need to establish it for at least a month, then start working on the next habit.